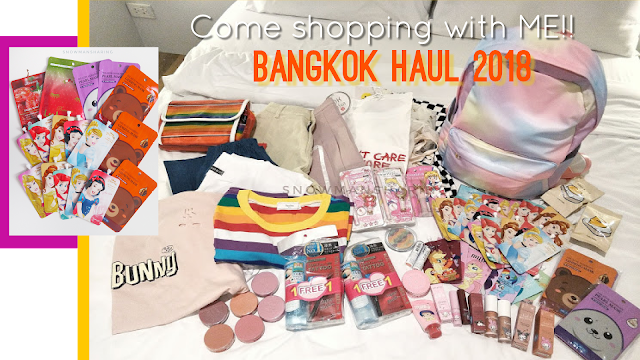 Here's my most anticipating post about my Bangkok trip is my Bangkok Haul. Frankly, this is my first time actually talk about my haul so I am not sure what kind of information that you guys would like to know. I still have tons of photos to edit and screw the raw file I think my first few days photos are gonna be so grainy. 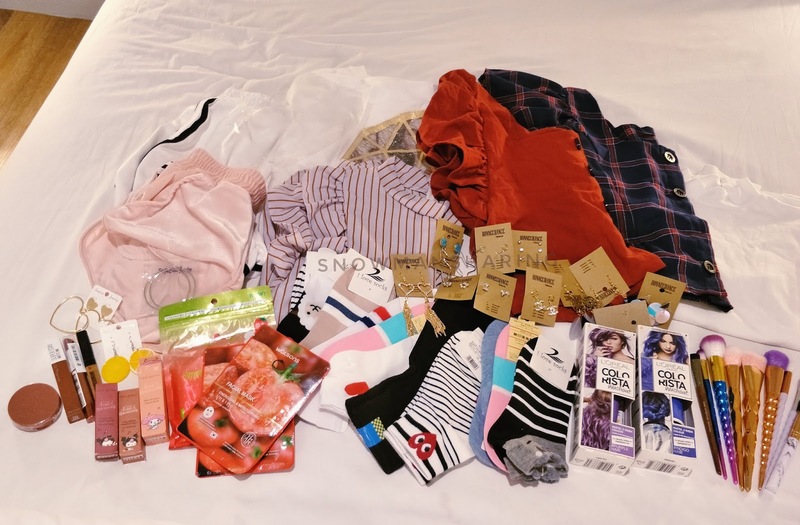 Anyway, in this haul post I will try my best to let you guys know the price and where I actually buy it from. In case you'll notice there's no price meaning I forget how much it cost already. 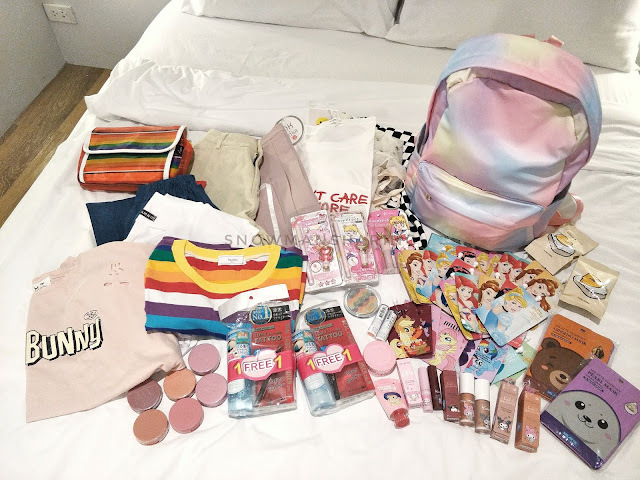 I section my haul to beauty, skincare, accessories, and clothes. Do drop me a comment if there's any product you want to see me use or review too. 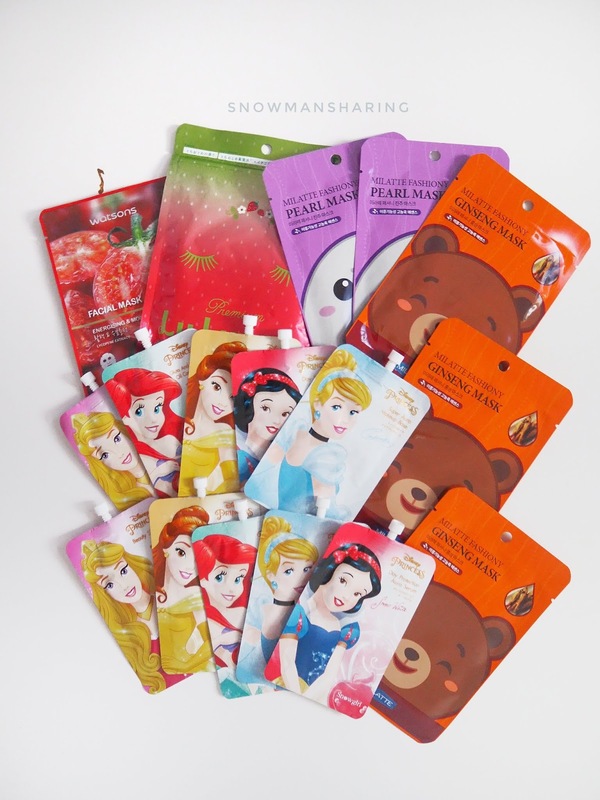 The top masks products are from Watsons. Well, I thought that the tomato mask is only available in Thailand and turns out is available here in Malaysia. Of course LuLus Mask always my must buy a mask whenever I see it! For the remaining mask and sample pack for skin product, I get from Bangkok Eve and Boy and The Beautrium. Both are the stores that I splurge most of my beauty haul. 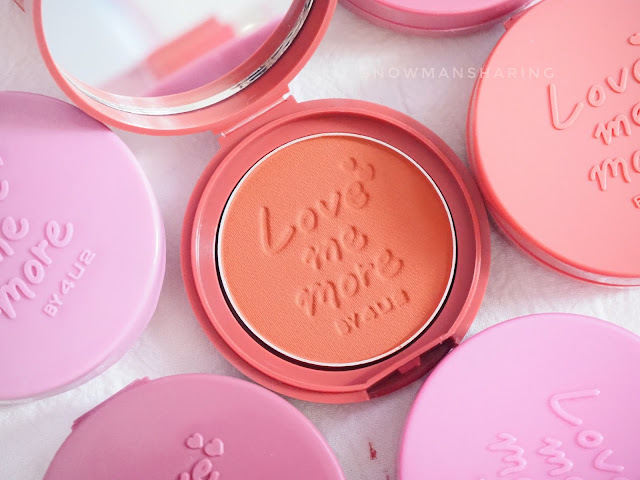 As you can see from the image above, I finally buy the blusher that I have been aiming since my friend introduce. Just couldn't decide which color is nice so I decided to get the colors that I like haha! Oh ya, there's two colors which are in buy 1 free 1 promo too. Lucky to be there when Sanrio Melody launches a cute series of products with Cute Press. So we manage to grab some of the makeup items from this collection too. 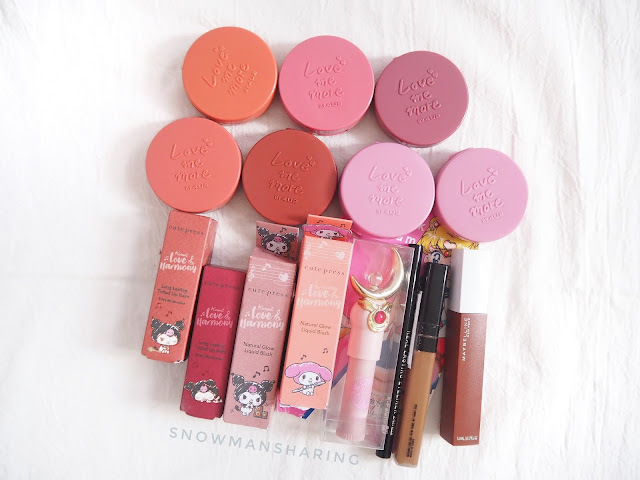 The one I bought is their blusher, for the lip balm is my friends one! Isn't the blusher super cute and pretty! Not only that the packaging is compact and pretty, the quality and pigment are really good too. Will try to do a review and sharing soon. 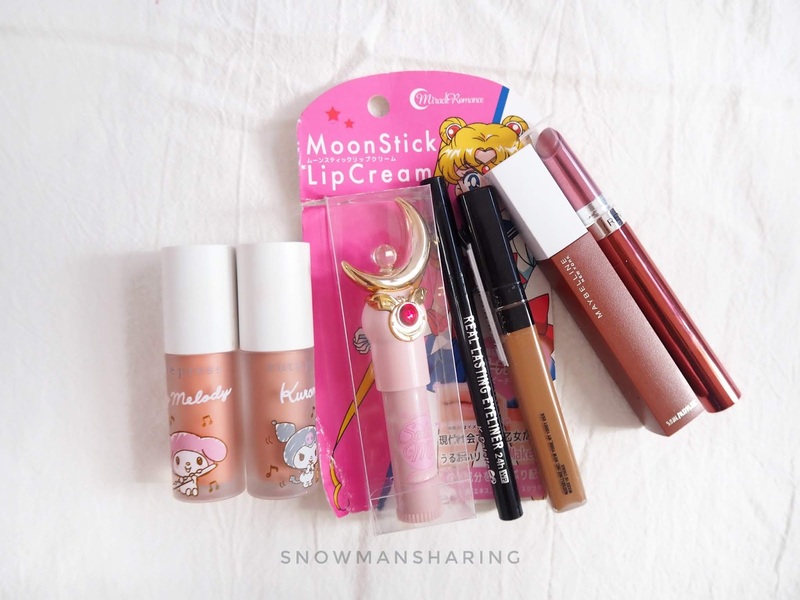 For the Sailormoon lip balm, I just got it because it was the cheapest in the collection. The eyeliner is one with the makeup remover which selling at promotion price too. As for the Maybelline Super Stay Matte, is not on my top list too because the review is half bad and half good. However, I decide to get it because I love the color very much! Where Revlon Ultra Hd Gel Lip is super comfy and smooth to apply. Cheap and have a really good moisture too on lips! I am gradually looking for a nice hair band too. In this trip, I manage to find and grab some for myself. I wouldn't say that the price is way cheaper than I think but still affordable. Even though we didn't manage to walk through the entire night market due to rain, we still manage to grab some cheap and pretty earrings too. The earrings show is only shown mine and mixture that I got from the mall and night market. I manage to grab some for my friends too. 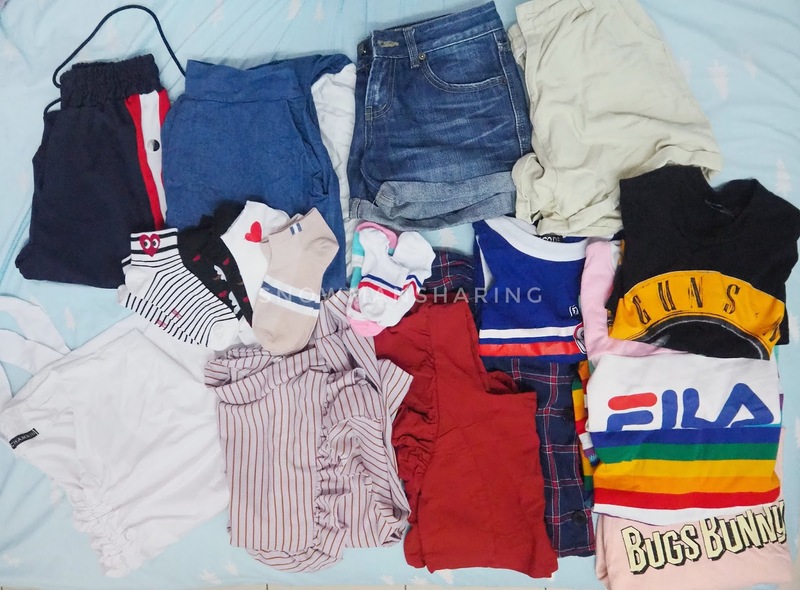 Next up we move on to my clothes, socks, and bags haul. 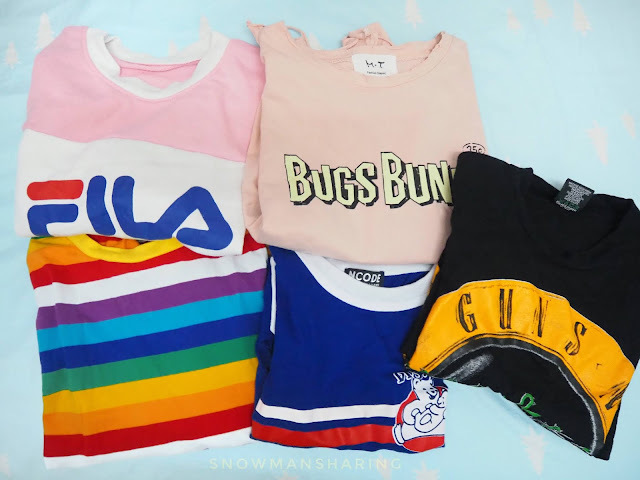 There have never been enough tees for me and here I am grabbing another 5 tees from Bangkok. I would say the color selection is really colorful! 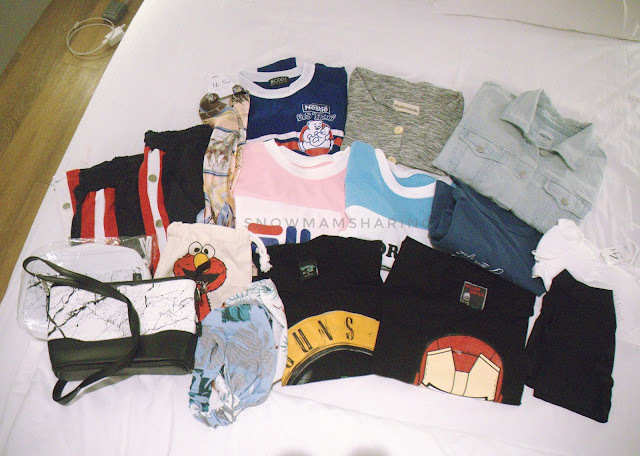 haha, Cheapest tee that I manage to grab is 100 thb but Nicole did manage to grab on sales section for around 50 thb only! Some fancy tops that I also manage to grab. Not to say it was cheap but when the price below 200 thb still can consider to get it! For the middle two pieces top is from the same shop. Is one of the tops that I wanted to get for myself. Well, 160 thb is not that bad as well. 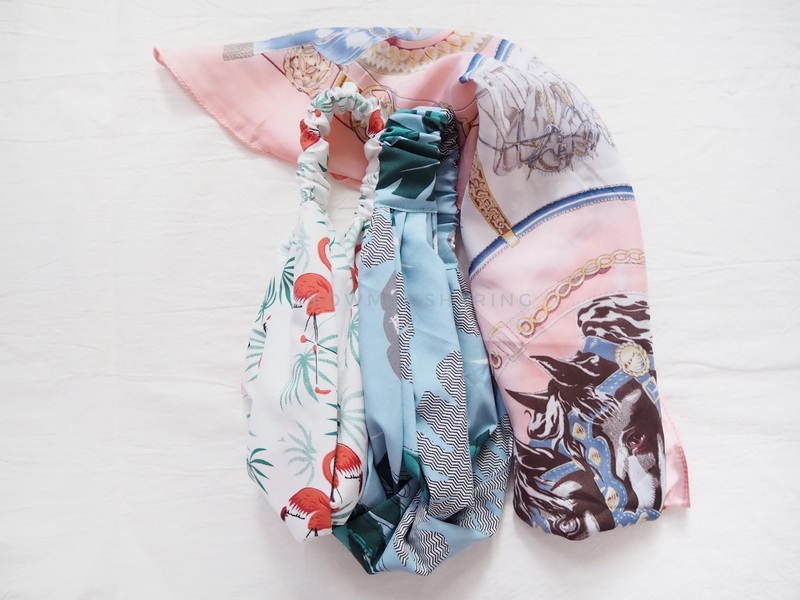 For bottoms, quality like Taobao the price range is around 200 - 400 THB. Depends on you looking for denim materials or normal pants quality. For the 100 THB denim, since I can't try it and I got myself the wrong size. 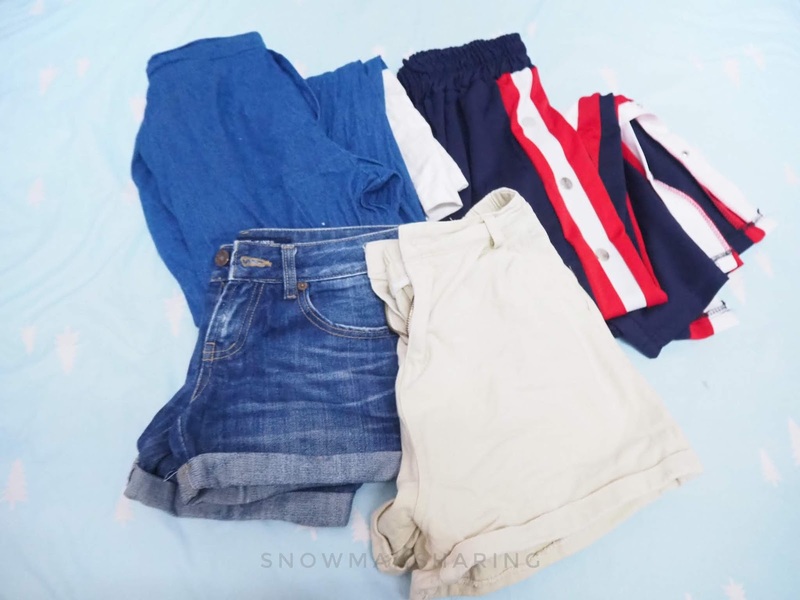 Is just 100 THB for a pair of short jeans!! Isn't it too cheap! 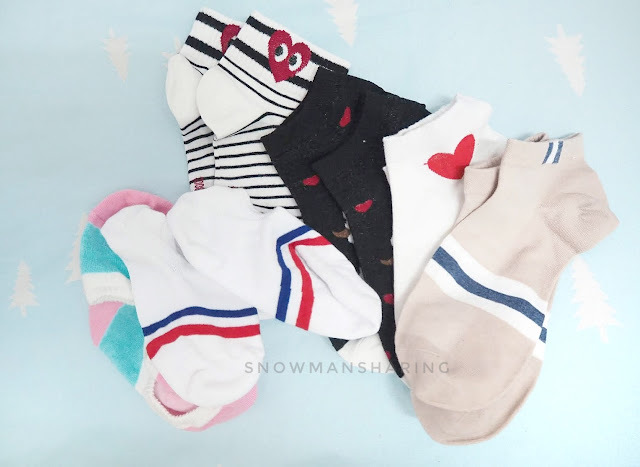 We thought to share but after when you go through all the cute socks selling there. You just can't resist yourself but to grab all the socks for yourself. Ended up both of us buy separately with our own selection of 6 pairs of socks. The quality and material are considered as average. I didn't get those random bag design from market or mall. So the two bags I got is from Riya and one bag from Naraya. Basically, these two brands are quite well known in Thailand. The one on the left and bottom right one is from Riya. 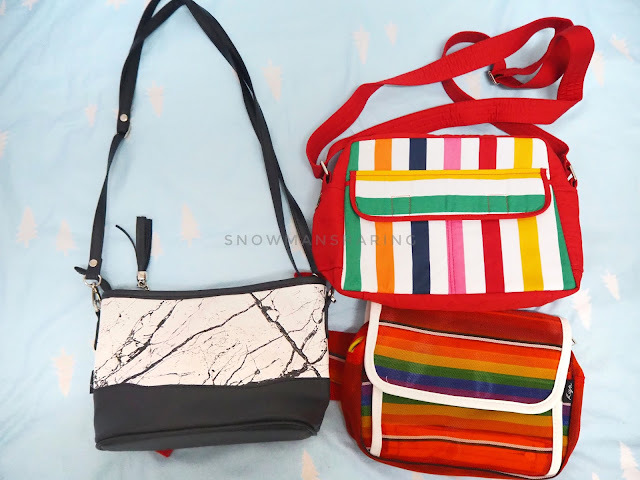 The top right rainbow bag is from Naraya. I am into rainbow style recently and straight away bought a lot of rainbow bags and top. Remaining three pieces that I forget to take haha! Another one of my favorite white tee with an outer layer of lace. Super pretty! Another two short pants that I bought from the night market. For snacks, we bought some of the big packets of snacks and divide among ourself. 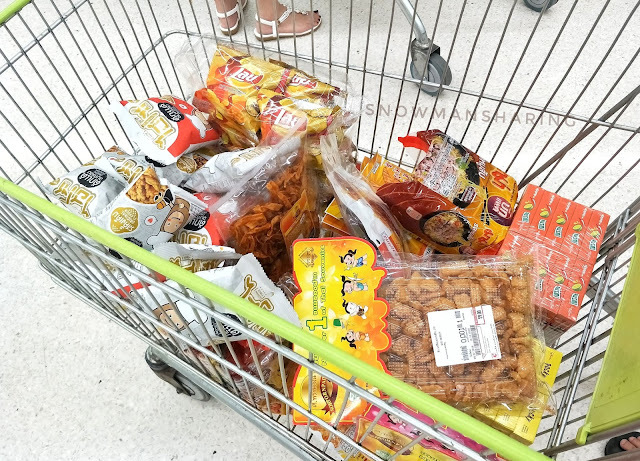 I spend around 400+ THB of snacks and drinks. For the daily haul, I take is together with Nicole that's why it looks a lot!! Really having fun shopping and exploring some of the places in Bangkok. Recommended place shopping for clothes item and accessories, I will say is their market, no matter is day or night market. It has the cheapest price range compare to a mall. Whereas for beauty products I recommend to shop either at Eve and Boy and The Beautrium where located at Siam area. I am thinking to write another post for the shops I recommended to shop in Bangkok. Do stay tuned! Check out all my Bangkok post here. I used to visit Bangkok 5 years ago. READ!! 在曼谷的少女粉色系店还是咖啡馆!? Top 4 Shops MUST VISIT in Siam, Bangkok!! 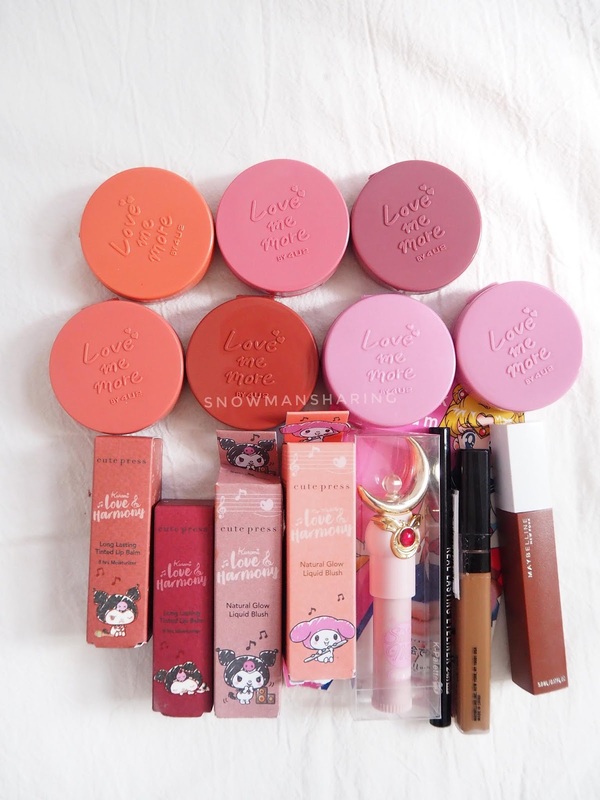 Banyaknya shoppig..oh my..kalau i dapat macam ni..happy tau..boleh release tension..hehee..barang makeup tu nampak best.. Yes every girls love to shop! Oh. I love those makeup haul that you got. And I love the fact that the price is much cheaper too. And I love Bangkok. Love all their beauty items! I really hope I can visit there again!